The death of Joseph Stalin. 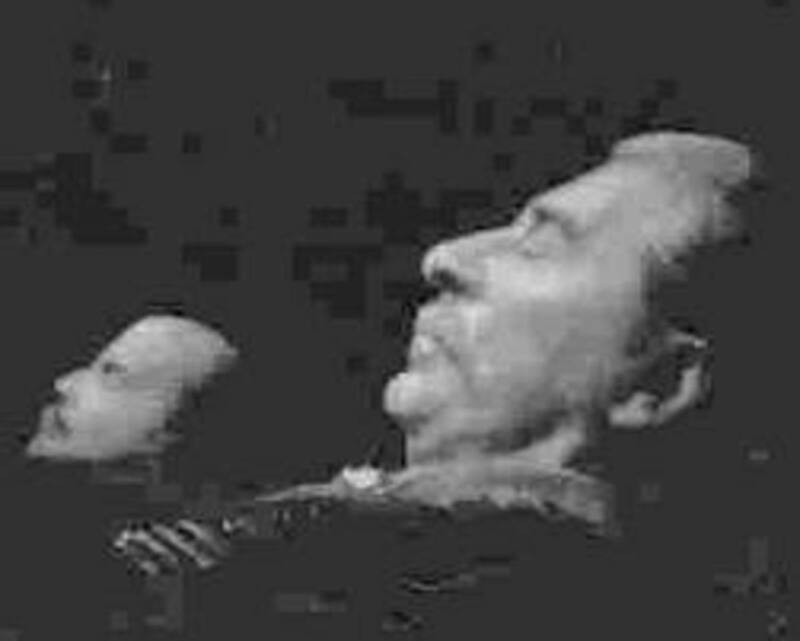 Soviet Russian Dictator, Josef Stalin, meets his end, March 1953. The Empire of Joseph Stalin. Joseph Stalin prepares for bed. A visitor for Stalin, and a warning from an old acquaintance. The Final End of Joseph Stalin. (In this world anyway). A short history of The Gulags. Joseph Stalin. "Hero" of the Soviet Union. Lenin and Stalin in death. "Together forever we two". 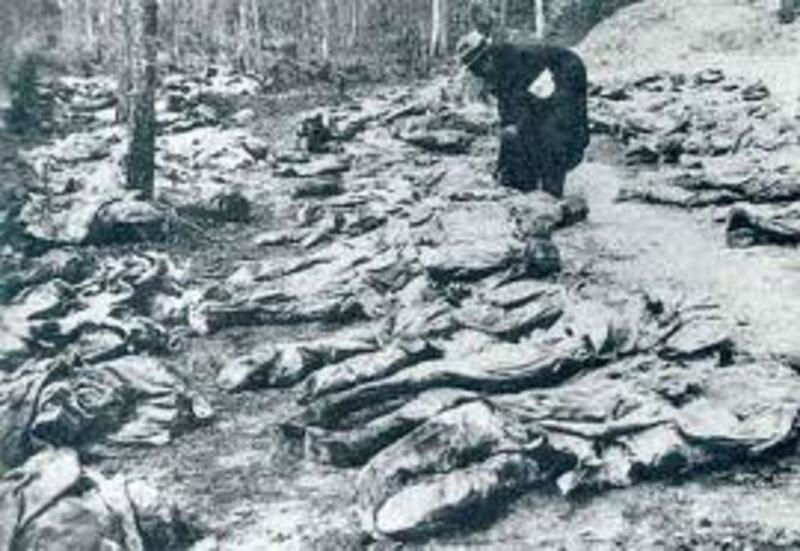 Murdered polish officers at Katyn. 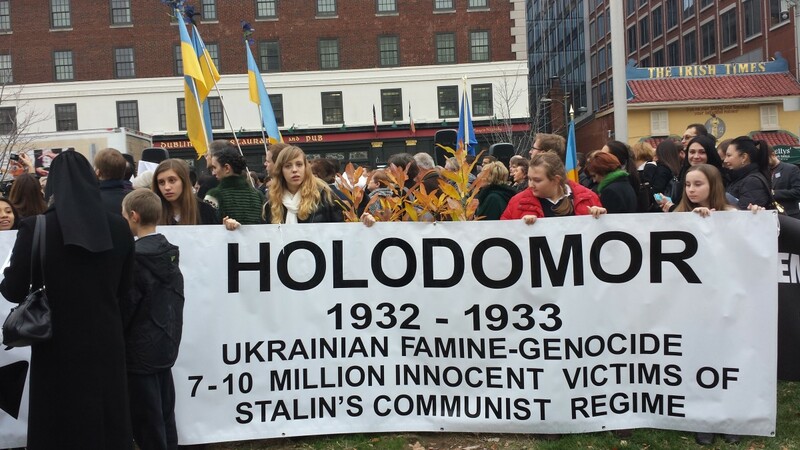 Their death was ordered by Joseph Stalin. 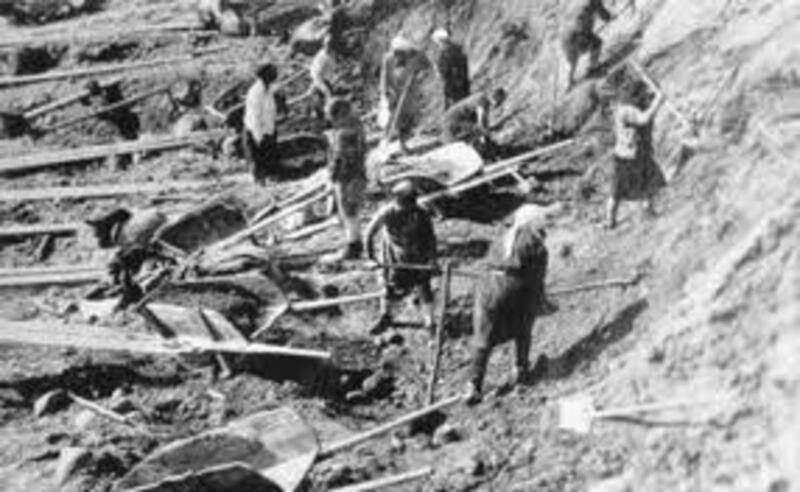 Helping to build " The Socialist Dream" in one of Stalin's siberian gulags. 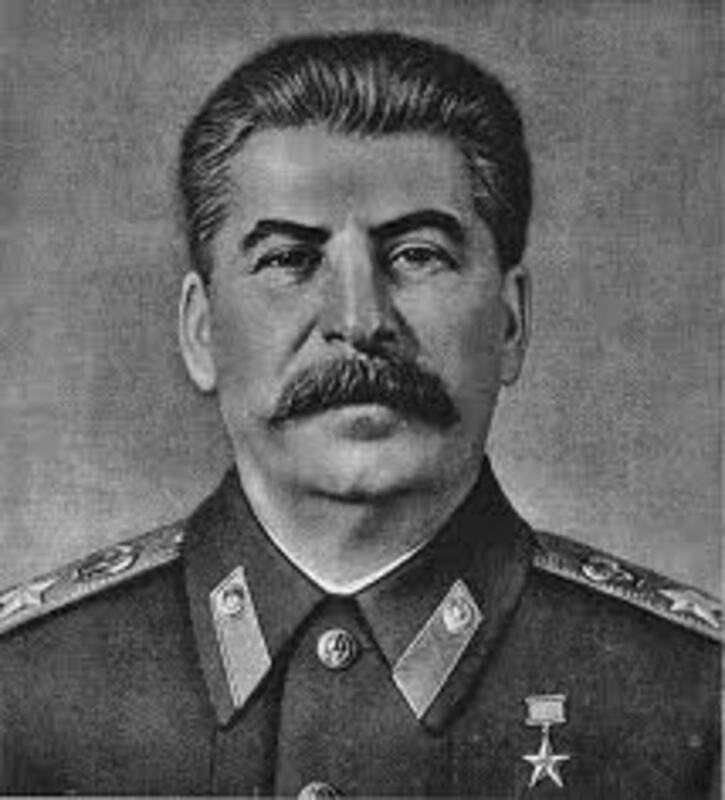 Joseph Stalin ruled The Soviet Union with a rod of iron from 1924 until his death in March 1953. Many millions died as a direct result of his policies due to famine and starvation. Many more were directly murdered on his orders, and uncounted thousands of unfortunates endured years of hell in the "gulags" of Siberia. Much has been written about his death, and the mysterious circumstances that surrounded it. This story is an attempt to suggest a possible ending for such a man. I dedicate it to the victims of Joseph Stalin, and to all those who have suffered political oppression and murder throughout history. March 1st 1953. Outside the dacha the snow fell steadily. It had been falling almost all the time from the previous November. The Russian winter was always long and bitter. The darkness and the icy blasts that the winter months brought seemed to the nation to have lasted since November 1917. Even in the hot months of the year, in June and July when the wildflowers bloomed on the steppes, and shy lovers held hands as they strolled by the banks of the Dnieper, a frigid dread entered the hearts of the people. In small flats throughout the country that was once the Great Russian Empire widows silently wept when they remembered the husbands that had been snatched from their lives in the middle of the night at the hands of the dictator. Husbands that they were afraid to even acknowledge they once had, lest some spy in the neighbourhood might see the silent tear run down their cheek, and then they themselves would disappear also in the night, to become non persons to their fearful neighbours. In Poland it snowed as well. It fell heavily over the mass grave in Katyn Forest where the flower of Polish chivalry lay mouldering beneath the trees, put there by the scratchy signature of the same twinkling eyed Generalissimo. In Siberia it fell on the almost skeletonised remnants of people who also had once strolled in the sunshine by the rivers. It fell on the greatcoats of the dead eyed guards who stood over them with machine guns and whips, watching for any signs of slacking, as they struggled to lay railway sleepers for the latest "great triumph of socialist endeavour". By the side lay the bodies of those who were blessed by death, either because cold and starvation had taken them, or because they were shot, or whipped because they were not working fast enough. In the bedroom of the dacha it was warm and comfortable. The old man that was at the apex of the pyramid that had brought the "glories" I have just described to his people prepared to go to bed. In the living room Lavrentiy Beria, Georgy Malenkov, Nikolai Bulganin, and Nikita Khrushchev warmed themselves by the fire, and threw sharp tasting glasses of vodka down their throats, as they prepared to adjourn to their own sleeping quarters. They only made desultory small talk to each other. Although they had known each other for many years, and were each guilty of atrocities in their own right, they had an almost palpable dread of the old man in the bedroom, and they were all totally distrusting of each other, because any unwise word could be betrayed to the leader; and he had shown in the past that no notion of loyalty, or level of sycophancy could save someone once his suspicions were aroused. A click of his arthritic fingers, and death could visit any of them before the dawn. He had become so paranoid that he was recently heard muttering that he was beginning to distrust even himself. The four "statesmen", and the guards that were in the house as well, knew that under no circumstances were they allowed to disturb Joseph Stalin once he had retired for the night. To so much as cause him to momentarily wake in the night by coughing within earshot of his bedroom could mean an instant death sentence, or transportation to the hell of the Siberian gulags. So they knew they would have to wait in the morning for the bell from the bedroom. Perhaps some of them wondered why he had to have such privacy. Did he need the time alone to pray to God for forgiveness of his sins? Perhaps he needed to confer with another power? Most likely none of those thoughts occupied the minds of the other occupants as they prepared for their own sleep. They all detested him anyway. Most of them would have been wishing fervently that he would die soon. Joseph Stalin had power of instant life and death over millions, but he had no real friends. In the bedroom nobody prayed. Nobody conferred with the devil either. Even Satan might hesitate before entering that chamber. Josef Stalin divested himself of his uniform. Plans about who to eliminate in the morning were the only thoughts that were swimming around his head as he prepared for bed. The doctors had been the most recent group to fall victim to his paranoia. Their only crime had been to excite the suspicion of the ailing dictator. A smile of satisfaction flickered across his face when he remembered reading accounts of their examination under torture. Oh how they had squealed in the small rooms in the basement of The Lubyanka. Over the fireplace there was a picture of Lenin. Stalin looked at it and then spat into the fire. While he knew that Lenin was evil like him, he despised him for not having the ruthlessness to get rid of him before his stroke in 1922. Still it was good PR to have people think that he was a disciple of the dead founder of the state, so the picture remained. There were no pictures of Leon Trotsky on display. The co-conspirator, who had died with an ice pick in his head in sunny Mexico, had long become a non-person in Stalin's Russia. His pictures were even excised out of the old newspaper archives. "Josef. Josef". "Soon Josef. Soon"
Stalin shook himself and growled. "No Devil is going to frighten the great Josef Stalin. I have abolished you from the land. You and your friend The Christ. You were both superstitions. 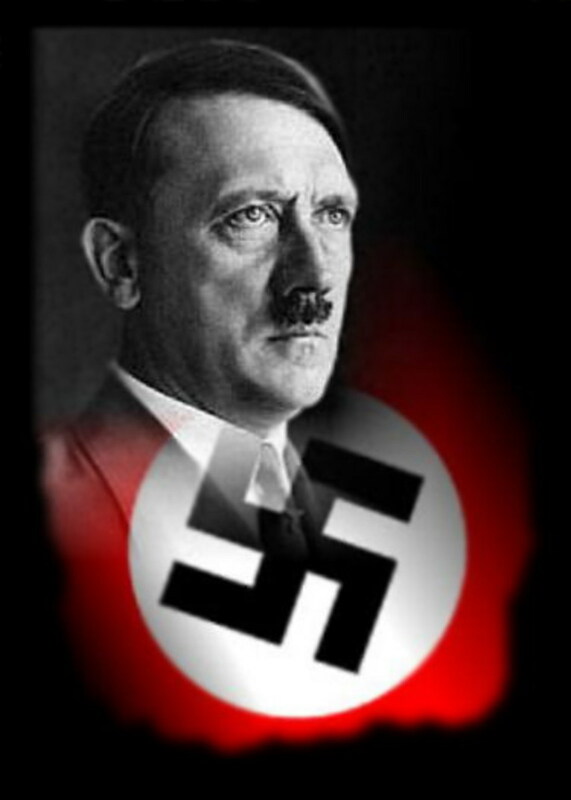 Even though I had to kill millions to do so I have eradicated you". Then a sly smile came over the face of the man in pyjamas. “I don’t need to fear you anyway" he said. "You owe me. I extended your Kingdom over most of Europe. I helped you to gain sway over China. I sacrificed those polish officers to your glory. 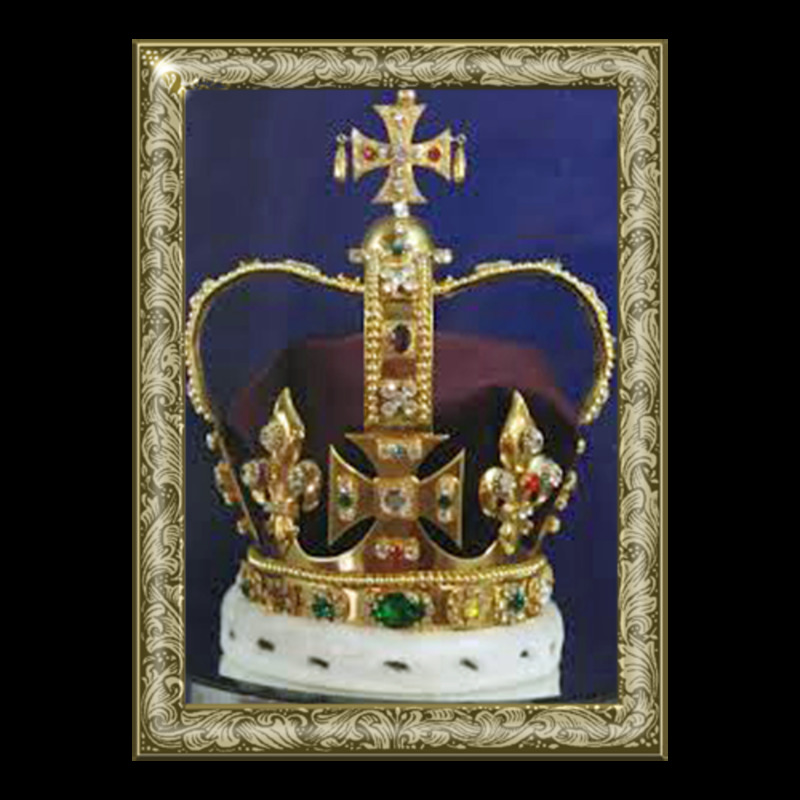 Millions are mouldering throughout Russia that your name might be honoured. You can’t frighten me Satan. You would never hurt me. You owe me too much". Then a voice came from just over the fireplace. Stalin recognised this voice. Oh yes, he knew this voice only too well. He had sat in rooms in the Kremlin with the owner of this voice as they plotted the future course of the revolution. He had sat with this man as they drank vodka, and laughed together as they read the accounts of how their subordinates had chased the daughters of the last Tsar round the basement room in Yekaterinburg, before blowing their brains out with pistols. Oh how they had laughed. There was no trace of mirth in the voice of Lenin now. For that was who was speaking to him. He looked at the picture over the mantelpiece. It was not the same as he had always remembered it. It had been a painting of the founder of The Soviet Union looking confident and wise as he sat in his office in The Kremlin. But now it had been transformed into an image of the most abject terror, and the most mind chilling despair that it was possible to imagine. Blood seemed to be oozing out of every pore of the tortured face. The shadows of flames seemed to flicker on the walls of the dungeon room where the long dead dictator seemed to be sitting now. The smell of sulphur was coming even stronger from the picture. 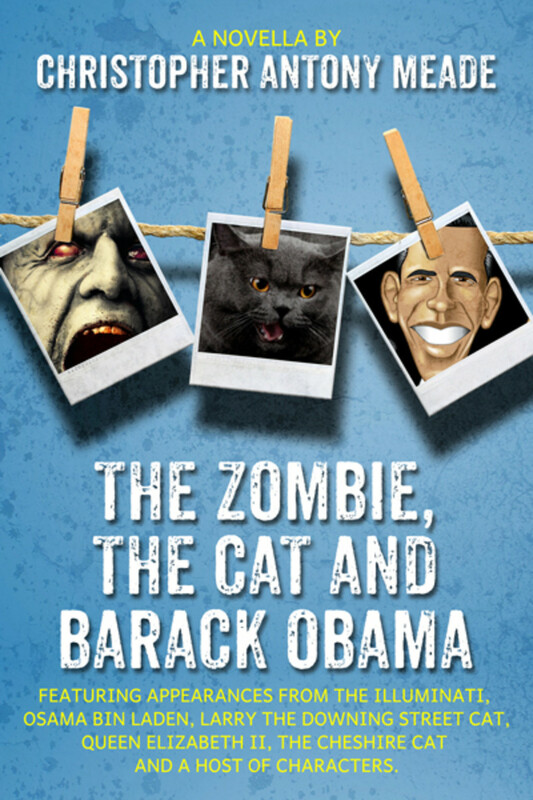 It was mixed with a loathsomely sickening smell of decomposing flesh. The carpet of the Iranian shah got stained by dictatorial vomit as Stalin brought up the remains of the last meal he would ever eat. Still, despite the trembling that was now starting to take over his entire body, his gaze was irresistibly drawn back to the painting. The voice of Lenin, that voice that had often waxed so lyrically over the beauties of his hometown, or had him in stitches describing the death throes of tortured white Russian women, now sounded so full of despair, and so tortured with infinity of agonies, that it struck terror into Stalin's heart. "I once felt like you" it said. "I once thought that The Devil owed me also. When I sat in that room in Switzerland, planning the ruin of The Russian State, and smiling sweet smiles when I contemplated the deaths of millions, I thought just as you did. I believed, that if The Devil existed, he would be so happy at the work that I accomplished for him, that he would fix it for me to live forever. But Satan is a treacherous master. He is not called "The Father of Lies" for nothing. Just when I thought that things were going right for me, and for him, in 1922, he caused me to have a stroke. I lingered for two years and then my body died. One thing was true, however. Although my body is lying like a grotesque carnival freak in Moscow for the gullible to view, my soul cannot die. I am living now, and will live till infinity in the kingdom of "The Lord of The Flies". The torture and the anguish are beyond description. This is how Satan rewards his faithful followers. In four days you will be joining me here." The flames in the picture seemed to leap further up the walls, and the smell of the sulphur, and the odour of decomposition seemed to fill the room so much that it was a torture to breathe. From beneath the now dribbling figure of the Supreme Marshal of The Soviet Union came the first voice again. It was accompanied by a peal of demonic laughter. A cold gust of wind seemed to blow through the room again. A flood of warm urine soaked Stalin's pyjamas, as he collapsed on the floor. Late the following day the worried guards finally plucked up courage to enter their boss’s room. They found him lying on the floor, soaked with urine, and totally incapable of coherent speech. There was a delay in getting medical attention, either because they were afraid to treat him in case he would recover and, perhaps take action against them for allowing him to get ill, or, others say, that they didn’t bother getting him a doctor because they wanted to make sure he died. Four days after his stroke he actually did die or at least his body did. The deep snow that had blanketed all of Russia, and a good part of Europe started to melt a little bit. Despite several attempts to redecorate and fumigate the room that Stalin collapsed in, the smell of sulphur and decomposition could not be eradicated. One other strange thing. The picture of Lenin that had been over the fireplace was most mysteriously burned to a cinder. The United States and Russia: Closer Together? Or Closer to War? Stalin wasn't even Russian. He was Georgian. Thanks for reading and commenting. It is the same with many countries, it is not the people that hate us, many still remember the aid given by Britain and the USA during WW2. The hatred is stirred by the Russian government for their own reasons. 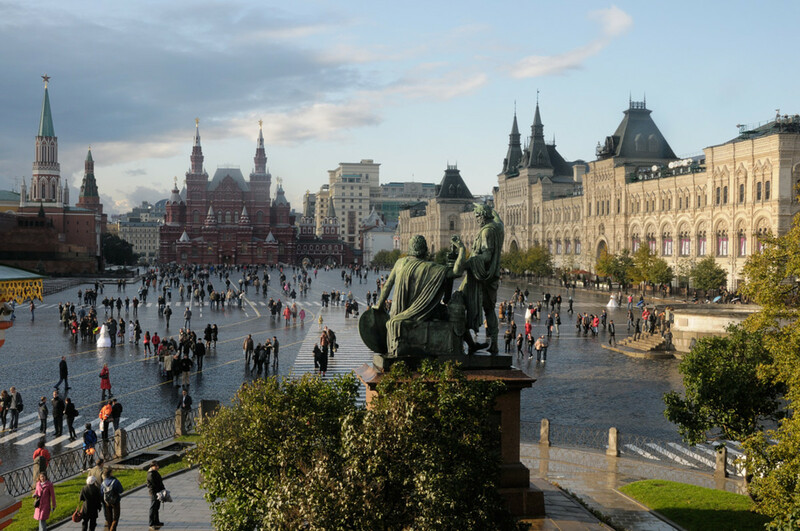 I travel to Russia quite frequently and generally find the people warm and friendly which is more than can be said for Russian immigration !